Don’t Go Thinking I’m More Adventurous Than You! I had a couple of lovely comments from Mums watching the funny stream of muddier and muddier instagram photos appearing during my visit to Penn Festival. Many suggested how brave I was, or how well I was coping with mud up to the kids knees. So I thought I’d set the record straight, because I don’t want you all reading my blog and thinking ‘Oooh isn’t she clever – I could never do that!’. I am definitely NOT more adventurous than you! Two years ago I’d never been camping and never been to a festival. Not one tiny festival, even as a teenager or student. How boring is that! As part of my mid-life crisis I decided I was going to be more adventurous and do things I’d always wanted to do. So I literally convinced myself that I was up for it by reminding myself regularly of how adventurous and magical my life was. Last year, we went off for our first adventure to Just So in a Yurt (proper glamping to start me off slowly). Finding it a huge success I decided that this year was going to be even more adventurous, and that I also wanted to try out holidays that were maybe simpler and cheaper so that I could review them for my blog. Luckily for me it’s all been pretty easy. The gorgeous Romany from FestivalKidz contacted me to review Penn Festival and hence I am now a ‘proper’ festivaller who has experienced a musical mud-fest extraordinaire, plus my first camping trip (check out the video of hubby putting up a tent in 3mins), and found that as long as I can make it look vaguely pretty I can handle anything. (Especially with a shed load of lists!). Hopefully I get so see what it’s like to go to a non-muddy festival in a tent later in the year as Just So have invited me back to review their new location and even more fabulous line up. This time we are going for the full event and not leaving until the monday, so that we can soak up the whole magical environment; the organisers of Just So have the most incredible imagination when it comes to kids, so it’s bound to have LOADS of adventure in it. In a few days I’m going to be able to let you know what it’s like to be in a mobile home holiday camp in Normandy care of the lovely people at Siblu. I would always have wanted to try something like this, but I must admit I’m not sure I would have been brave enough to try something so different if they hadn’t contacted me. So if you would also be nervous of ferries, and caravans in france, perfect, because I can let you know how it all pans out and you’ll know whether it would work for you too! I’m really excited about seeing what Siblu is like because when we went for our first summer holiday last year I realised how ridiculously expensive it is if you want practical accommodation for a young family (i.e. inter-connecting hotel rooms or studios). We found a cheap holiday in Cyrpus in a studio apartment. But one family I met had to pay for TWO studio apartments, just because they had 3 kids rather than two, literally doubling the price and therefore meaning they could only go for one week. So although Siblu would be about the same price as that holiday (when you add in Ferries etc), it would be a totally different situation for people with more kids. Plus if you don’t want to fly with your kids, it’s a perfect idea. I’m not naturally adventurous. I’m just 43, and decided that I’m done with thinking that all the adventure is for other people and not trying things out myself. I’m sure some won’t work out, but some will be great. So when you see all the fab things I tell you about on my blog, rather than think ‘I’m not sure I could do that’, think instead ‘Well, if Lisa can do it, then so can I!’. I think its pretty adventurous going to a festival. I’m 35 and still haven’t been as I’ve always liked my luxuries and not sure how I would cope without a shower and toilet! However now my children are getting a bit older I can see myself being forced into going camping soon. I think the yurt sounds a great compromise though – the experience of camping without all the mud! Hertfordshire mummy – the yurt was definitely a great way to start off, and I’m now really into a full on proper camping trip next year. Don’t worry about age – last year was my first and I was 42! 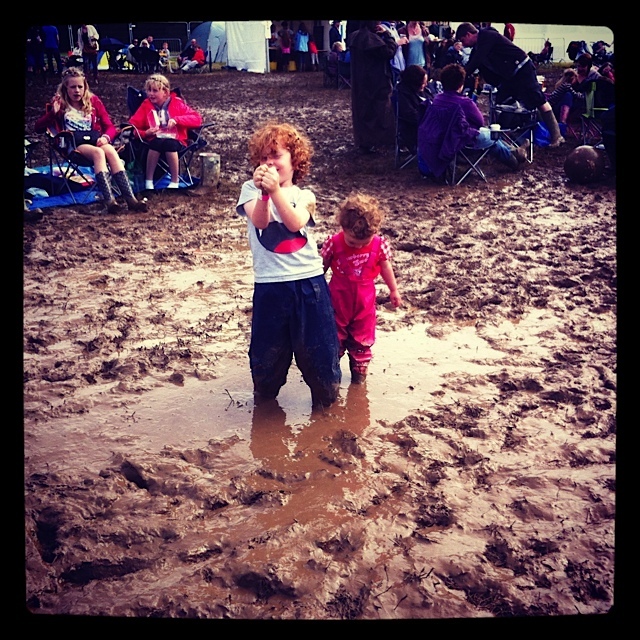 Still aiming for glastonbury when my kids are teens though!